Children need constant change and are always looking for adventure. The Ahrntaler Sonnenwege (sunny trails) and especially its Ahrntaler Hexensteig (Witch’s trail) is the ideal spot to give families such exciting adventures. It starts at the Platterhof mountain lodge from where you walk to the rushing Frankbachwasserfall (waterfalls). Continue on and pass an old millstone which tells us a little about the farm life of long ago. You then get to some rocks which are ideal for children looking for adventure and who want to test their climbing skills. 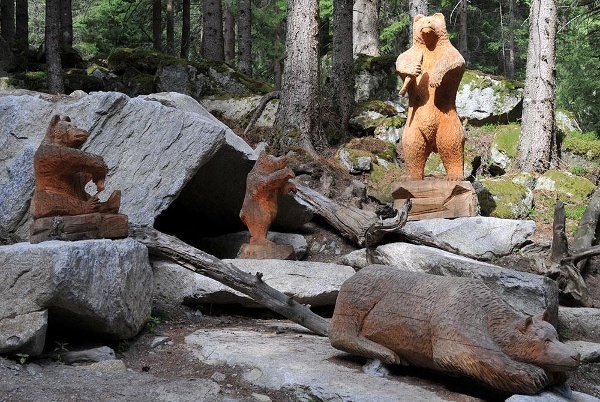 The very brave children may even dare to enter into the bear cave and walk through the 20 m long underground tunnel where they will have to pass the witch’s big chair and a wooden carved family of bears before reaching the end of their hiking destination – the family friendly Bizathütte (lodge) which welcomes you with its mountain restaurant.